I always thought that turbo rat used leds for clipping. Was I wrong? check out my build notes and the multi rat schematic with the various options. I had some really great results. Goes really well with a VOX amp and humbuckers. Great layout Mirosol, highly recommended build. turbo rat is with led's. you dirty rat is with germanium! Thanks for the layout ! I tought Prco You Dirty Rat was Ge. Give your opinion, If you had a handful of diodes 1n270, as you implement these on the circuit? Does a mix of 1n270 and 1n914 sounds good for you? Note that i placed the diodes so that they can be taken on a switch :) So swap the 2M2 for 220K and have your way with the clippers. Could please anybody give some explanation how to implement the switch / how to take the diodes on a switch? Thanks a lot for any help! No help please? Or any adwise where to find an answer? HI. Just remove D1 & D2, take a wire from where one side of D1 (or D2) to a switch (pin2) and another wire from where the other end of the diode was to the switch (pin 5). Place your diode choices across pins 1 and 4, and 3 and 6 for a DPDT switch and hey presto. Thanks for your help! I`m just on the beginning to understand those things. One more step! There are also a lot of mods which can be implemented, of course, like the Ruetz mod for chaning the 47R resistor to a pot for smoother overdrive. I guess you can verify it. Built it and all functions work. Not 100% sure on the filter thou. Seems to be cutting to much treble. I'll check my values. Call it good. I think the doides on a switch would be well worth building in also. Got a nice little bit. Thanks guys. The Filter control is something that i've hated on every Rat i've ever build (which is the reason i'm still prefering my build of Arion MMP), so i do believe that is a feature. You could swap the pot for 50K or even smaller to make more usable. I've built the early version from here for a friend. After some playing around we decided to use a 1nF cap instead of the 3.3nF, that gives you a much more useful tone/filter range too. 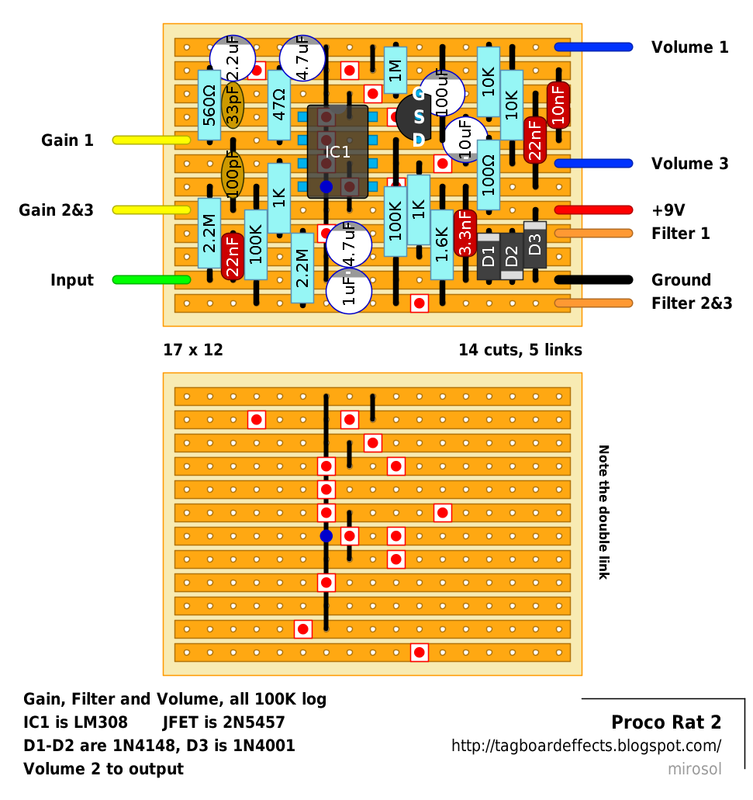 Also it is worth to play with the clipping section in the basic Rat layout, as that can really give you different tonality. In the latest one he decided for a Si + LED combo, but my personal favourite is the Si + Ge combo. quick question, does the resistor change for turbo version apply to dirty rat too or is that 2m2? Played with this some more. Sounds good on a Vox type amp. One question on the resistor change. There are two 2.2m's on the board. Which one gets changed? The one going from input to ground (the one on the left) is just a pulldown resistor, so that won't make a big difference. Try the other one. Yup. The other one from vref rail to 1K resistor. Hi, I've just build this board, but got several problem at first. First is the feedback which is ear piercing. Then the sound drops of gets cut when I strum power chords like chug-chug. I've made some changes and somehow improves playability and tone. But still I get a bit of sound drop/cut on power chords. I replaced the 1uF electrolytic with 100uF; the 2.2Mohms with 1Mohms and will soon try the 220K. I put a 1nF cap on LM308 pins 3 & 4. I also did a 1K pots Ruetz mod. I also put in switch for clipping selection, 1-RedLED/RedLED; 2-BlueLED/Zenr-Zener; 3-Si-Ge/Si-Ge. The RedLED/RedLED is not lit when I use it but has sound. The BlueLED blinks fine when selected and I like the sound. The Si-Ge/Si-Ge is weak in volume. What have you done to get rid the feedback? mine is squealing in a insane way, when the cable is unplugged. What can be done to solve this? I'm not sure how much gain this has taken away from the pedal but it still sounds fat with a fuzzy-ish gain (LM308). I had to do this too. The cap you added is a 1nF on the actual RAT and is missing off this build. I can literally tune my squealing. I'm not sure why. Please help, Anyone. is there a difference between lm308n and lm308 ? This layout seems to be missing a 1nf cap to ground after the 1k resistor feeding the noninverting input of the op amp. This maybe the cause of the squeeling some people have noted when nothing is plugged into the input. I just finish building a second one of these and it's really gated, like, I get sound if I hit the strings then it cuts out. I checked for solder bridges, what super obvious thing am I missing? Yes, hopefully very obvious. It's just the simple matter of checking the circuit through until to find it. Double, triple check all your cuts and layouts. Then move onto component values, off board wiring, etc. Take a break, and come back to it fresh. Check FET orientation, are you using an alternative op amp? Some wont use the the compensation cap 33pf. I went back through it tonight, everything checks out, I even compared it to the last build I did. I can't figure it out. I'm using the correct fet and opamp. I either messed up a cut somewhere or one of the caps I didnt replace is faulty. Luckily I socketed the fet and opamp. Hi I've just finished my second build of this circuit neither working correctly. The circuit shows no sign of Volume gain until about 3 o'clock on the volume pot, but the main problem is that when I turn up the Distortion I get a really high pitched squeal which lowers in frequency the more the Distortion pot is turned up. I am using the OP07 Opamp if that helps, also I have tried more than one opamp with no difference, tried different JFET's and checked their orientation and run a knife between the tracks. Any Ideas? OP07 is not pin to pin equivalent with LM308. Since the LM308 compensation pins are used for offset nulling on OP07, your behavior is expected. There is no straight on replacement for LM308, so to get your circuit working right, you'll need LM308 chip. Or you could read the application notes on OP07 datasheet to figure out how to set up an offset nulling trim for the OP07. I'd still recommend getting the correct chip as the Rat won't sound like a Rat without LM308. Thanks, for some reason I thought they were pin equivalent as I see some people use them. That will teach me not to check my data sheets. It can be used, but not as is. The circuit will need tweaking for it to work properly with OP07 (or any other single opamp). LM308s are widely available through ebay and the prices are not that bad either. If you use a 308 and still get the squealing try putting a buffered pedal in the chain. Hey guys, shouldn t the clipping filter cap / res pairs be matched the other way around (that is, 2.2uF / 47 Ohms and 4.7uF / 560 Ohms instead of 2.2uF / 560 Ohms and 4.7uF / 47 Ohms)? At least that s the way it appears in most schematics... I have implemented the original rat version from your vero layout and the pairs there are also the opposite way than what appears here. Given the chance, I cannot even start telling you how great your work is. I m grateful! i know that the original rat was setup that way, but i do not believe the rat 2 is. what you could do is take the rat 2 layout as it is and put sockets in place of the resistors and swap them to be like the original, or it gives you the ability to try different values and see what you like. Hi Zach and thanks for your comment :) What makes you believe that rat 2 is not set up this way? I haven't found any schematics showing it any other way... Swapping the resistor values would give you a 721Hz and 129Hz pair of low pass filters instead of 1539Hz and 60Hz - and this filters the input to the opamp (see here : http://www.electrosmash.com/proco-rat). The higher of those is practically almost identical to the Ruetz mod with the 1K potentiometer set somewhere halfway (see here in the 1k potentiometer section : http://www.diyguitaramp.com/rat.html) thus making the rat much more of a gentleman and I m not sure that this is the sound that most people expect to hear, at least at the start :) I d be interested to hear your opinion on those above, and please contribute any sources if available! The rat is such a great pedal!! no problem buddy. i looked those sites and didn't see the schematic for the rat 2. now, there could be different versions of the rat 2, and have slightly different values for certain areas. i do believe that there is more of a difference between the rat and rat 2 then just the clipping section, just MHO, but i could be wrong. like i said i would just socket the resistors and put them as they are in the rat and see what happens. when i built my rat, i altered those resistors to help make it better suited for bass, but by doing this i also altered the gain. about that 1n cap. without seeing the schematic it's hard to say it belongs there. you can put a socket in that area for that cap, and see how it sounds with and without it. usually layouts don't get verified if there's something wrong with them, so i would say it's same to assume it shouldn't be there. but experiment and see what happens. i know there is a lot of sonic differences between the rat and rat 2, so the things you're seeing could be the reasons. I built this today and it sounds amazing. However, the layout as depicted above is missing a component (if you examine closely the RAT 2 schematic and actual units). There should be an additional 1n cap to ground between the 100k resistor and pin three on the IC. I incoroporated this into my build by extending the width of the layout by one column. It still fits very comfortably into a 125B. I also added a switch that toggles between yellow diffuse LEDs and the stock silicon clipping diodes... and I'm glad I did, because I prefer the LEDs. Finally, I implemented the "Lube" mod from Beavis Audio and put the 560r resistor on an on/off switch. All mods highly recommended. I feel like I have the most versatile RAT pedal ever! Hey guys I have a proco rat distortion and I would like to mod it by adding a 3 way toggle switch like jhs mods ha and my questions is where do conect or witch componnent to remove to add my toggle switch. Please help me. Thanks. I bulit this last week, sounds good, but a lack of taste to me, I made a few mods, LM308 Metal can, D1 and D2 replaced woth BAT41 Ge diodes (sounds powerfull and I have too much overdirve/distortions with 4148) remove 47R to 1K pot (sweet spot there to find fine tune, and 560R one leg lifted to on/off swich. on most RAt 2 schemes seems that 2.2M from the left is replaced with 1M, I will try that change as well to low as 220k. I mean the right 2.2M. Also can anyone tell me the cap between pin 3 & 4 What exactly does? BAT diodes aren't Ge diodes there Schottky diodes, which are silicon and have a different clipping threshold, hence the different distortion characteristic you hear. If you used Ge diodes you would have a smoother, more compressed distortion and less output. The other things you mention are common mods done to the rat to control the frequencies affected by the distortion, I think it's call the Ruetz Mod, so more or less bass. As far as the cap, I don't see one between pins 3&4, there's one at pin 2 down to gain 2&3 which is 100pF, and a red one that's 22nF. The 22nF is the input cap, the 100pF is a lowpass for the distortion and cuts off the high end of the distortion smoothing/softening the clipping making it less harsh. Thanks Zach your are right about BAT, actually is a big cristal germanium diode with only 41 number writen, (bigger than clasin 1n60). there is no cap in pin 3 and 4 I saw on several schematics from Rat 2 and the older ones, seems to be an standard, also I saw the JHS mod that changes the cap between pin 3 & 4 from 1n to 10n. So that's the question how affect that cap to the sound. Interesting I wonder what those diodes are then. If you're looking at the same schematic I just did, there's a 1nF cap from pin 3 to ground, which is what pin 4 goes to as well. It's just a high frequency roll off. I went agian to store to find some info. ITT and 4 Was the only letters written on them. Also I bought a couple of gold bonded Oa47 for next proyect. Btw cap for pin 3 and 4 makes a good small improvement. Just built this and as noted by others, there should be a 1nf cap going from leg 3 of the IC to ground. I built this pedal according to the layout and it worked fine but I got a squealing sound when I stopped playing/strumming, adding the 1nf cap removed this squealing noise. Did Anyone build the Rat with another IC like TL071 or similar ? No one has noticed that the 560R and 47R should be swapped around to be correct to the original pedal. I got the squeal that somebody else got. I followed the original Rat schematic, so I added the 1nF between the two wires Gain 1 and Gain 2 & 3, but it is just a bit attenuated. Then I swapped the 2.2uF and the 4.7uF, replaced the output cap 10uF with a 1uF, left out the 10k resistor between the output and the ground, replaced the two 2.2M with two 1M resistors. The squeal seems come something wrong with the ground, I guess. 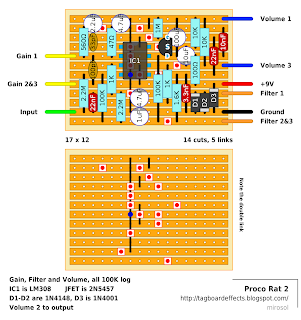 If I low the guitar volume the pitch of the squeal change, even with the Distortion pot of the circuit. A bit like the Fuzz Factory effect. I built a pair of the modded version from Sabrotone without any issue, now I wanted a stock version, but this layout seems a bit tricky. Are you sure it's verified? Thanks so much for this summation, definitely going to make these changes soon. Works great for me. Replaced the diodes with blue leds and it roars. It has a bit of self oscillation which I think I can solve by cleaning up my wiring. Did you test the circuit out of the box or straight closed into it with all the offboard wiring? Both. Just skimming through the comments, i think ill try to add the cap between leg 3 of the IC and ground also to see if this helps.